Mozilla announced in April that it planned to unify the look of its Firefox browser across desktop and mobile platforms, and on Monday a developer working on the project posted an early preview of the resulting new “Australis” interface. While Firefox developer Madhava Enros posted some mockups of the new look when the original announcement was first made in the spring, this week Mozilla Software Engineer Jared Wein took those images a step further with a close-up look at the Australis tabs currently being added to the Windows version of the open source browser. A test build previewing the new look in Firefox 16 for Windows is available now as a free download from a post on Wein's blog site. Specifically, gentle curves will be a hallmark of the new interface, appearing in the desktop version's tab bar along with mobile versions' navigation bar. Similar in many ways to the tab style used in Google's Chrome, Australis tabs feature softly curved edges, as shown in the screenshot at left. 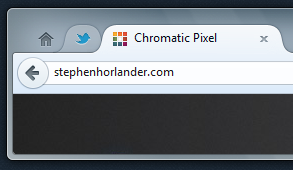 Only the active tab is rendered using a curve, however; inactive background tabs are rendered without a background, almost as if they're part of the window's title bar. The new look isn’t yet an official part of the Firefox nightly builds, but “it should be coming along soon,” wrote Wein, who also apologized that it wasn't yet available as a preview for users on Linux or OS X. If you're on Windows and can't resist checking it out, Wein asks that you leave any feedback or suggestions in the comment section of his post.